Monday, September 19, 2011, 6 p.m. The Ottawa Board of Health met in the Champlain Room, 110 Laurier Avenue West, Ottawa, on September 19, 2011 beginning at 6:00 p.m. The Minutes of the regular meeting of August 15, 2011 were confirmed. Letter from the President of the Ottawa Council on Smoking and Health to the Medical Officer of Health regarding Smoke-Free Outdoor Spaces. Letter from Medical Officer of Health to the President of the Ottawa Council on Smoking regarding Smoke-Free Outdoor Spaces. That the Rules of Procedure be suspended in order to provide maximum time for staff to investigate and consult on Member McRae’s motion regarding the City of Ottawa’s Smoke-Free By-Laws. 2. Direct Ottawa Public Health staff to explore options for further expanding the provision of preventive dental care and early-stage dental treatment to adults with low incomes. That the Board of Health for the City of Ottawa Health Unit receive the July 2011 Monthly Communicable Disease Report for information. 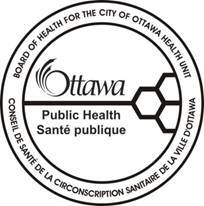 Ottawa Public Health staff will ensure the Ottawa Board of Health is able to fulfill its obligations as outlined in the Public Health Accountability Agreement. Pursuant to Section 16 of By-law 2011-2 (being a by-law of the Board of Health for the City of Ottawa Health Unit respecting delegation of authority to various officers), the Medical Officer of Health has the authority to sign the Public Health Accountability Agreement. Accordingly, Dr. Levy will sign the Agreement on behalf of the Ottawa Board of Health and Ottawa Public Health staff will then send the signed Agreement to the MOHLTC. 2. Direct staff to bring forward a report at its November 19, 2011 meeting to establish a Board of Health Financial Committee. That the Board of Health for the City of Ottawa Health Unit approve the 2012 meeting schedule outlined in this report. Be it resolved that the report entitled, “2012 Board of Health Meeting Schedule” be amended to replace the May 21 meeting with May 7 and the September 17 meeting with August 20. That the Board of Health for the City of Ottawa Health Unit approve the attendance of Members Hutchinson, Keeley and Kapur at the Association of Local Public Health Agencies’ (alPHa) Fall Symposium, to be held October 20-21, 2011 in Toronto. BE IT FURTHER RESOLVED that a joint Ottawa Public Health and City of Ottawa’s By-law and Regulatory Services and Legal Services report with recommendations on updating the City of Ottawa's smoke-free by-law, including any operational, financial and enforcement considerations be presented to the Board of Health for recommendation to the Community and Protective Services Committee and City Council. BE IT FURTHER RESOLVED that a joint Ottawa Public Health and City of Ottawa’s By-law and Regulatory Services and Legal Services report with recommendations on updating the City of Ottawa's smoke-free by-law, including any operational, financial and enforcement considerations be presented to the Board of Health by Q1 of 2012 for recommendation to the Community and Protective Services Committee and City Council. Motion No. 6/4 was then put to the Board and CARRIED. That the Medical Officer of Health’s verbal report; Access to Dental Health Services for Adults with Low Incomes report; Health Status Reporting: July 2011 Monthly Communicable Disease Report; Delegation of Authority – Contracts Awarded for the Period April 1, 2011 to June 30, 2011 report; Public Health Accountability Agreement report; 2012 Board of Health Meeting Schedule report; Attendance at the Association of Local Public Health Agencies (alPHa) 2011 Fall Symposium report; Influenza Vaccination Program 2010-2012 report be received and adopted as amended. A by-law of the Board of Health for the City of Ottawa Health Unit to confirm the proceedings of the Ottawa Board of Health at its meeting of September 19, 2011. The Board adjourned the meeting at 7:40 p.m.